For the past several months I’ve been working with fifth and sixth graders in two urban schools in Berkeley and Oakland, CA. 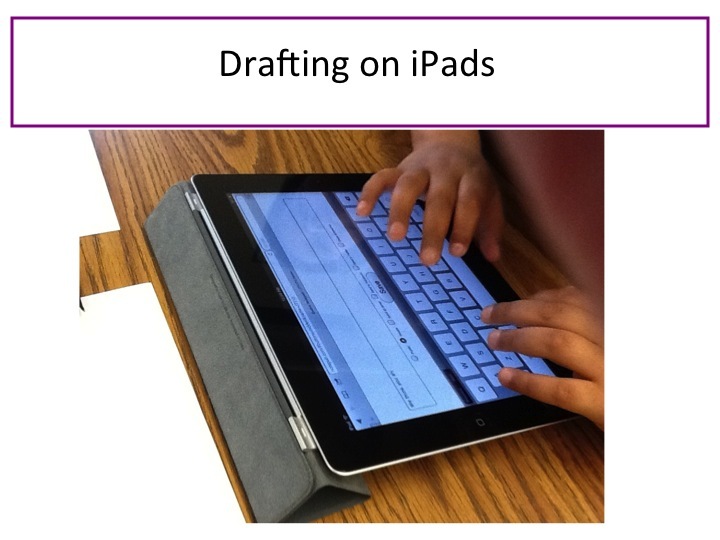 The project is designed to enhance integrated literacy and science learning and to explore how iPads can be used to support student engagement, self expression, and learning. Although I’ve been involved in using laptops extensively with students in classrooms, shifting to explore science learning through iPads has been a true learning experience. I’ve discovered that many applications and strategies for collaboration I’ve always drawn from aren’t directly transferable to working with a small touch screen. However, because collaboration is a vitally important part of learning, I’m dedicating this post to approaches for facilitating collaborative writing. One free platform I’ve used for collaborative writing is Mixed Ink www.mixedink.com. This educator friendly tool allows small groups or the whole class to reflect on several versions of a text written on the same topic and to weave ideas from peers’ work into a single text that credits multiple authors. 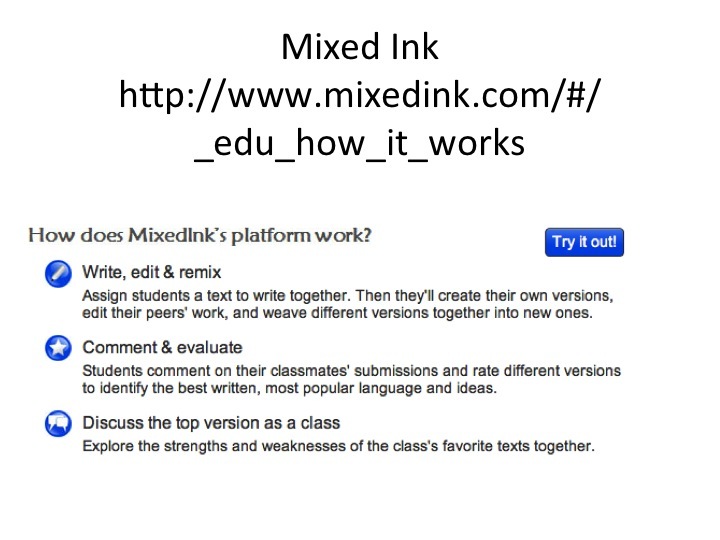 An overview of how the Mixed Ink tool works can be seen in the short video clip below entitled Mixed Ink for Educators. Ms. Kretschmar’s students completed a waste audit to analyze the waste their school produced. 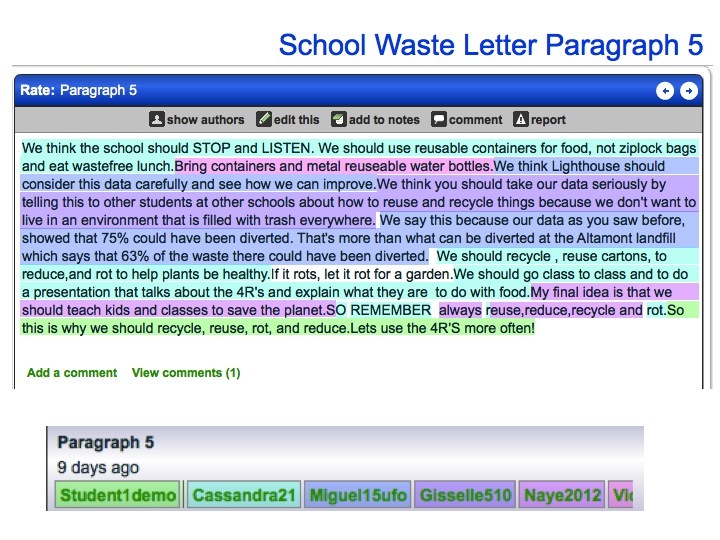 Prior to beginning the collaborative writing assignment, students discussed their experiences with the waste audit and shared ideas about how to communicate the surprising results they found to the school and community at large. The five phases the class engaged in as they documented and shared their experiences included: 1) writing; 2) reading; 3) rating; 4) remixing; and 5) revising. Not only is each aspect an important part of productive collaborative writing, these steps also address the Common Core State Standards that emphasize the use of digital technologies for reading and writing as support process skills such as collaboration, listening, and speaking. Ms. Kretschmar’s students draft their waste audit letter to the school community. 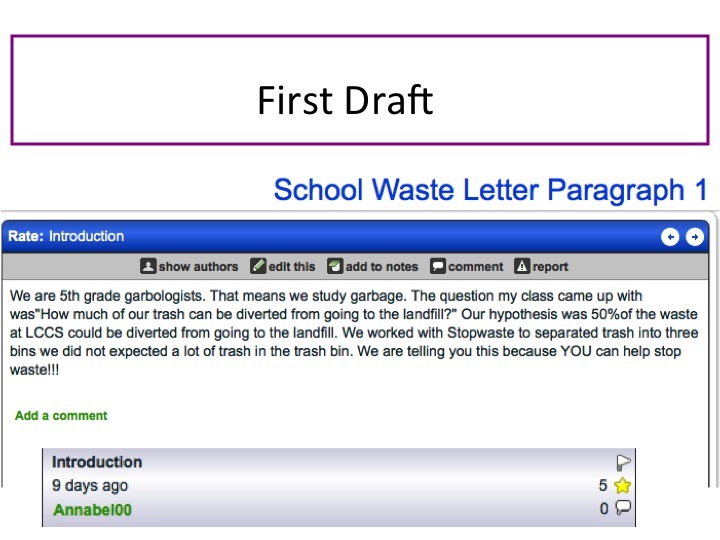 With the aim of helping the school and community become more mindful about their output of trash, Ms. Kretschmar structured a five paragraph writing assignment for her students and assigned each table group to complete one paragraph. Once she distributed Letter4School (a set of graphic organizers to support students when drafting), she encouraged table groups to discuss ideas before writing their paragraphs as individuals. 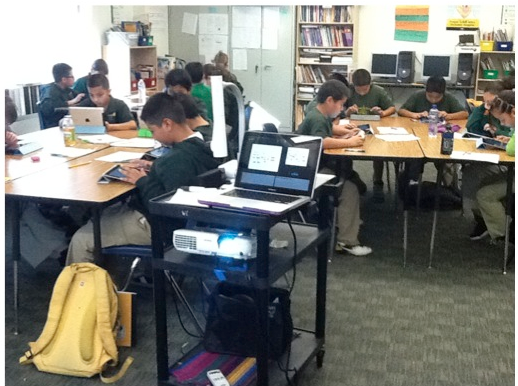 Then, students used the graphic organizers and iPads to complete a first draft. Next, students learned about online collaborative writing using Mixed Ink and discussed the process of peer support for adding content, revising language choices, and reorganizing their presentation of ideas. Then, students read each other’s work (staying within their original paragraph groups). After presenting the purpose of reading and rating, Ms. Kretschmar had students rate each other’s work using a system of stars which ranged from 1/2 star (needs more development) to five stars (very well developed). As students read their peers’ work, they looked out for ideas and language they could incorporate into their own piece to improve it. Using their peers’ pieces as mentor texts, students remixed new drafts by incorporating in elements of each others’ wording and language into their own piece (creating co-written pieces with multiple authors). The image on the left shows how the crediting process works (with each author recognized as contributing an element to the piece). 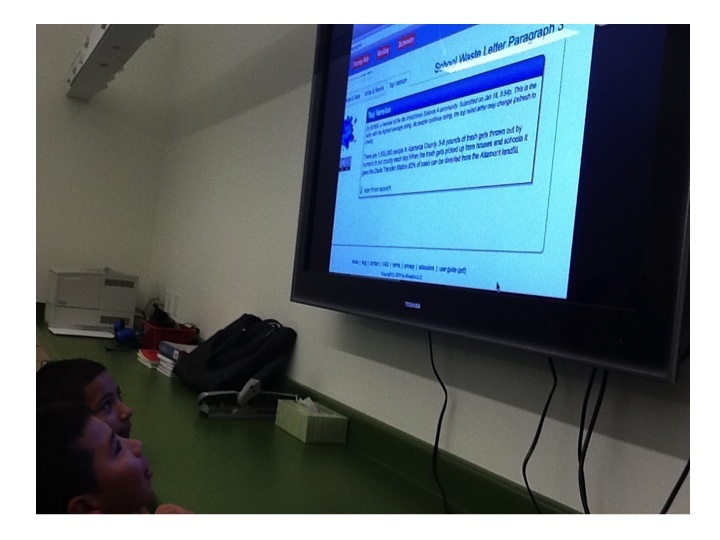 Students then rated each of the new paragraphs again. Mixed Ink uses a specially designed algorithm that surfaces the most complete and well-written piece based on student ratings. This featured “featured” version can then be discussed in terms of its organization, use of language, organization, or other characteristics. With help from the students, Ms. Kretschmar compiled the top rated five paragraphs into a completed piece that incorporated all students’ voices. The final version can be accessed by clicking on 5thLetter2Community. It takes advantage of the collaborative writing process in the creation of a well-organized, well-structured final product. A full set of slides documenting Ms. Kretschmar’s collaborative writing lessons can be viewed here. 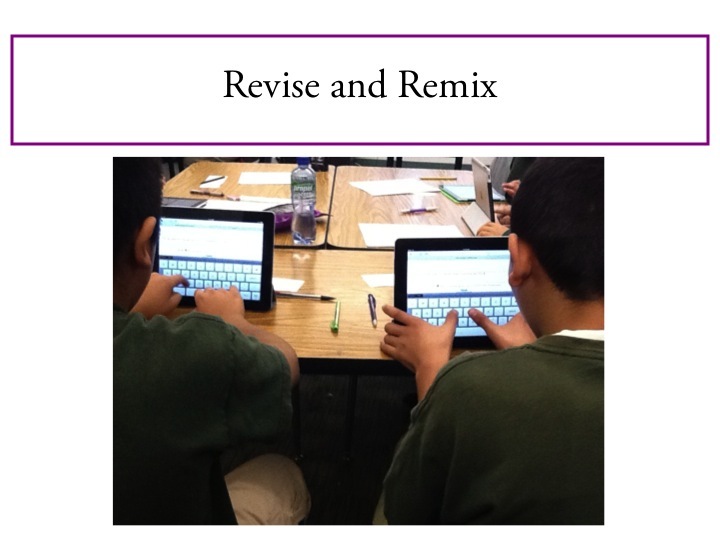 Collaborative writing in a digitally enhanced way has several benefits. First, it is a process that draws upon the strengths of the collective. Although one student may be stronger in critical thinking skills, another may excel in organizing or adding detail to a piece. By working in groups, students learn from each other while they complete an assigned task in ways that benefit the whole group. In addition, students working in collaborative groups can take advantage of other group members for peer review as they complete writing projects. More and more workplace activities involve working in these sorts of collaborative project teams. Giving students opportunities to work collaboratively can help prepare them for the advantages and pitfalls of collaborative work on the job. I’ve seen collaborative writing activities such as the one featured here, support students’ abilities to work together and problem solve while providing the context for content-rich conversations. We are eager to promote an exchange of ideas on this forum. We invite you to please add a comment to share experiences you’ve had with collaborative writing.